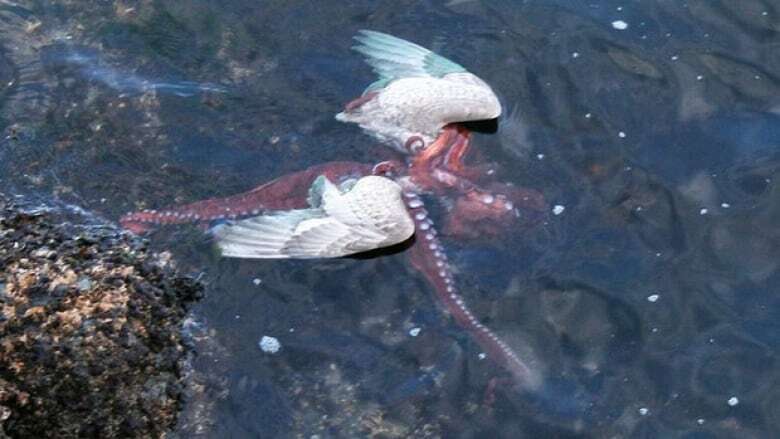 A deadly struggle between an octopus and a seagull has been captured in a series of unlikely wildlife photographs taken by a Victoria, B.C., woman. A deadly struggle between an octopus and a gull has been captured in a series of unlikely wildlife photographs taken by a Victoria, B.C., woman. Amateur photographer Ginger Morneau snapped images of the almost metre-long Great Pacific octopus eating the frantic gull, and when she searched for other images of similar battles she couldn't find any — lots of seagulls eating small octopuses, but not the other way around. "It became the proverbial fish story, except we had proof," she told CBC News on Thursday. The BBC Wildlife magazine and octopus researchers from around the world have contacted Morneau about the photos, which have become internet sensations. Morneau was walking along the city's popular Ogden Point breakwater with her husband and her brother when she saw what she thought was a seagull trying to get something out of the water. Then they noticed the bird wasn't lifting its head at all. "We realized there was an octopus wrapped around the head of the bird," she said. Morneau, a lifelong B.C. resident, began taking photos. "The bird was thrashing violently," she said. "He was fighting for his life, literally. He was struggling, he was flailing around. But you could see him start to get weaker. I don't know if it was loss of air, or whether he was gripped too tightly underneath the water. But it was definitely a frantic, really primal fight." Octopuses are known to have highly complex nervous systems and their arms can perform complex reflex actions. In laboratory experiments, an octopus can be trained to distinguish between different shapes and patterns. Some of the West Coast's most stunning undersea sights are located near the Ogden Point breakwater, which is frequented by undersea diving enthusiasts. Dive shops located near the breakwater advertise the presence of the Great Pacific octopus, saying the breakwater's wall is home to 10 or 15 at any given time. Some can weigh up to 25 kilograms and their arms can measure more than 10 metres long. Morneau said she was standing on the breakwater about three metres above the rocks where the battle occurred, but she was not able to attempt a seagull rescue. "Just before the bird died, I actually said to my husband, 'Isn't someone going to go down there and try and save that seagull?'" The fight was made more surreal because it was basically silent from their perspective, taking place mostly underwater. "When the seagull sort of gave up the ghost, you could see his last twitch, and knew at that moment he had passed," she said. Morneau said the entire battle from the time she noticed till it was over took less than a minute. Morneau admitted she was afraid herself to get into a tug-of-war with the deep-sea creature, which was almost a metre long. "Realistically, that octopus was too daunting," she said. "You get those little images in your mind of getting grabbed by the octopus yourself and pulled in. They're very primitive, intimidating creatures up close." Morneau said she laughed as the trio celebrated their adventure at a restaurant later with calamari — even though she knows the appetizer is fried squid.